In a previous article, I followed the various incarnations an instruction takes when it's being compiled from the source language to machine code in LLVM. The article briefly mentioned a lot of layers within LLVM, each of which is interesting and non trivial. Here I want to focus on one of the most important and complex layers - the code generator, and specifically the instruction selection mechanism. A short reminder: the task of the code generator is to transform the high-level, mostly target-independent LLVM IR into low-level, target dependent machine language. Instruction selection is the process wherein the abstract operations in IR are mapped to concrete instructions of the target architecture. This article will follow a simple example to show the instruction selection mechanism in action (ISel in LLVM parlance). 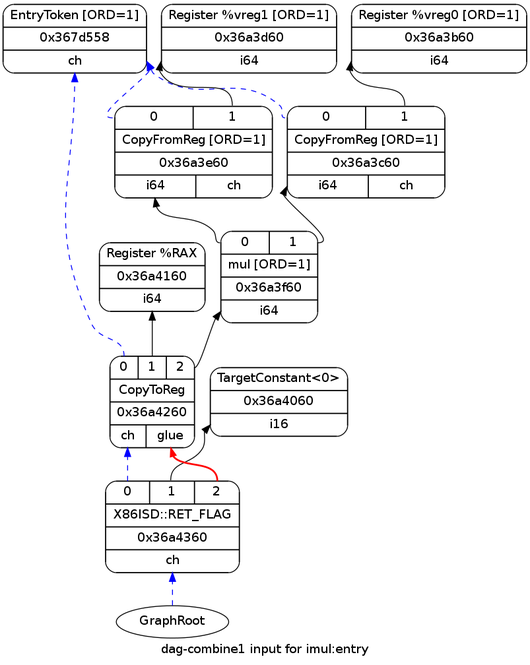 There's really not much interesting going on here, and all the types are legal for the target architecture; therefore, this is also the DAG that reaches the instruction selection stage. Instruction selection is arguably the most important part of the code generation phase. Its task is to convert a legal selection DAG into a new DAG of target machine code. In other words, the abstract, target-independent input has to be matched to concrete, target-dependent output. For this purpose LLVM uses an elaborate pattern-matching algorithm that consists of two major steps. The first step happens "offline", when LLVM itself is being built, and involves the TableGen tool, which generates the pattern matching tables from instruction definitions. TableGen is an important part of the LLVM eco-system, and it plays an especially central role in instruction selection, so it's worthwhile to spend a couple of minutes talking about it (there's also official documentation, starting with TableGen fundamentals). The problem with TableGen is that some of its uses are so complex (and instruction selection, as we'll shortly see, is one of the worst offenders) that it's easy to forget how simple the idea is in its core. The LLVM developers realized a long time ago that a lot of repetitive code has to be written for each new target. Take a machine instruction, for instance. An instruction is being used in code generation, in the assembler, in the disassembler, in optimizers, and in many other places. Each such use results in a "table" that maps instructions to some piece of information. Wouldn't it be nice if we could just define all instructions in one central place which collects all the interesting information we need about them and then generate all the tables automatically? This is precisely what TableGen was born to do. The 13.5 MB output only contains simple defs - table entries from which TableGen backends can take what they need. The def for IMUL64rr has something like 75 fields. But we'll only focus on the ones we need for this article, and the condensed description pasted above will do. This is the pattern on which the IMUL64rr can be selected. It's essentially an s-expression describing the DAG path that will be matched. 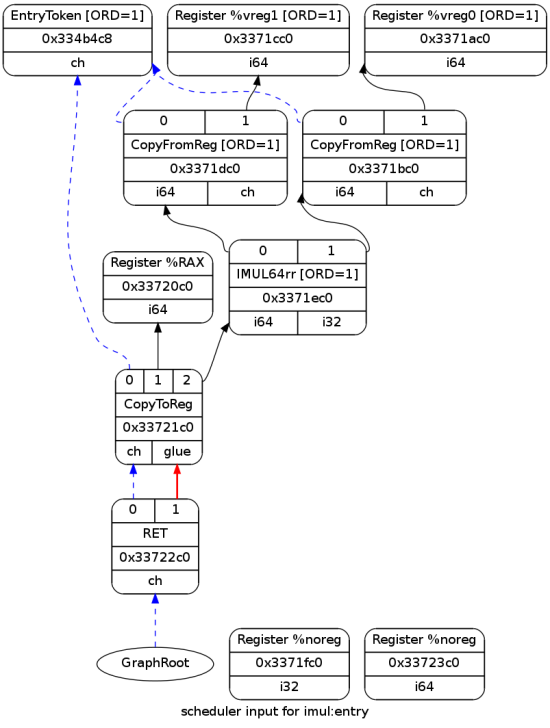 In this case it roughly means: an X86ISD::SMUL node (this is concealed behind the X86smul_flag definition) with two 64-bit GPR (General Purpose Register) arguments is invoked and returns two results - one assigned to a destination GPR and the other to the status flag register . When the automatic instruction selection sees such a sequence in the DAG, it will match it to the said IMUL64rr instruction. A careful reader will, at this point, notice that I'm cheating a little bit. If the node matched by this pattern is X86ISD::SMUL, then how did it match the DAG shown above which has an ISD::MUL node? Indeed, it didn't. I will show the pattern that actually matches the DAG shortly, but I felt it's important to demonstrate the instruction definitions with patterns, to enable me to discuss how all patterns are mashed together later. So what is the difference between ISD::MUL and X86ISD::SMUL  ? In the former, we don't care about the actual flags affected by the multiplication, while in the latter we do. In the case of multiplication in C, we usually don't care about the flags affected, hence ISD::MUL is selected. But LLVM provides some special intrinsics such as llvm.smul.with.overflow in which an overflow flag can be returned from the operation. For these (and possibly other uses), the X86ISD::SMUL node exists . // Selection DAG Pattern Support. list<Predicate> Predicates      = ;  // See class Instruction in Target.td. int             AddedComplexity = 0;   // See class Instruction in Target.td. // not needing a full list. The large comment at the top of this snippet is helpful, but it describes an exactly opposite situation of what we're observing for IMUL64rr. In our case, the pattern defined within the instruction is actually the more complex one, while the basic pattern is defined outside with a Pattern. TableGen descriptions of target instructions support numerous pattern kinds. We've examined patterns implicitly defined within instruction definitions and patterns explicitly defined as stand-alones. In addition there are also "complex" patterns that specify a C++ function to be called, and "pattern fragments" that can contain arbitrary snippets of C++ code that do custom matching. If you're interested, these pattern types are somewhat described in the comments within include/llvm/Target/TargetSelectionDAG.td. Mixing up C++ code in TableGen works because the final result of the TableGen run (with the specific DAG ISel backend) is a C++ method that gets embedded into a target's implementation of the SelectionDAGISel interface. The generic SelectionDAGISel::DoInstructionSelection method calls Select per DAG node. Select is an abstract method, implemented by the targets. For example X86DAGToDAGISel::Select. The latter intercepts some nodes for manual matching, but delegates the bulk of the work to X86DAGToDAGISel::SelectCode. X86DAGToDAGISel::SelectCode is auto-generated by TableGen , and contains the matcher table, followed by a call to the generic SelectionDAGISel::SelectCodeCommon, passing it the table. So what is the matcher table? Essentially, it's a "program" written in a sort of a "bytecode" specific for instruction selection. To enable flexible pattern matching while staying efficient, TableGen munges all the patterns together and generates a program that, given a DAG mode, figures out which pattern it matches. SelectionDAGISel::SelectCodeCommon serves as the interpreter for this bytecode. Unfortunately, the bytecode language for pattern matching is not documented anywhere. To understand how it works, there's no substitute to looking at the interpreter code and at the generated bytecode for some backend . // The main instruction selector code. At position 0 we have a OPC_SwitchOpcode operation, which is kind of a huge switch table on the node opcode. It's followed by a list of cases. Each case begins with its size (so that the matcher knows where to go if matching the case fails), and then the opcode. For example, as you can see in the listing above, the first case in the table is for opcode ISD::STORE, and its size is 13257 (the size is encoded in a special variable-length-encoding since the table is byte-based). So, as expected, this is the switch case with ISD::MUL as the opcode. The matching for this case starts with OPC_Scope, which is an instruction to the interpreter to push its current state. If something fails within the scope, the state can be then restored to proceed with matching the next cases. In the snippet above, if matching fails in the scope, it will proceed in offset 58133. This is the result of a complex pattern described above. SelectLEAAddr is a C++ method (defined by the X86 backen's ISel implementation) and it gets invoked to try and match the node operand to a LEA . The debug printout that follows comes from that method, and as we can see, eventually fails. Simply put, after it fails matching a bunch of optimizations and special cases, the matcher finally uses a generic integer-multiply between 64-bit registers, which is matched to the IMUL64rr machine instruction. If it appears from the trace that the instruction selector works hard to find a suitable instruction, that is true. To generate good code, some work has to be done to try and match various optimized sequences before falling back to generic ones. In the next part of the article, I will show some more advanced cases of instruction selection with optimization. Since the entry DAG was pretty basic, this one is very similar; the main difference is that the multiplication and return nodes were selected to actual instructions. imulq is the assembly (GAS flavor) representation of X86::IMUL64rr. It multiplies the function's arguments (according to the AMD64 ABI, the first two integers come in %rsi and %rdi); then the result is moved to the return register - %rax. This article provided an in-depth peek into the instruction selection process - a key part of the LLVM code generator. While it uses a relatively simple example, it should contain sufficient information to gain some initial understanding of the mechanisms involved. In the next part of the article, I will examine a couple of additional examples through which other aspects of the code generation process should become clearer. Although the status flags are "implicit" on x86 (there's no explicit register you can work with), LLVM treats it as explicit to aid the code generation algorithms. X86ISD::SMUL is the X86-specific lowering of the generic ISD::SMULO node. It's generated into <BUILD_DIR>/lib/Target/X86/X86GenDAGISel.inc, a file that's #included by lib/Target/X86/X86ISelDAGToDAG.cpp. If you want to understand how this bytecode is generated from the TableGen pattern definitions, you also need to look inside the TableGen DAG ISel backend. Note that the values in this table are relevant to the version of LLVM I have built for this example (r174056). Changes in X86 pattern definitions may result in different numbering, but the principle is the same. Some multiplications can be optimized to use the faster LEA instruction.